Are you looking for sleep aids for children that will help your child fall asleep and stay asleep? A good night's rest begins with you as the parent. It is important to provide your child with structure, schedule, and forms of soothing to prevent sleep deprivation and the resulting physical and behavioral affects. Sleeping comes more naturally for children. Insomnia in children is not normal. However, children often experience sleep problems and sleep deprivation because of a combination of lifestyle sleep inhibitors. 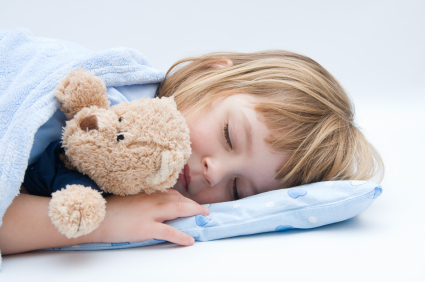 Rarely do children have a true sleep disorder. It is often what occurs during the day that determines how well children sleep at night. Use natural sleep aids for children to help establish healthy sleep patterns at a young age. * Have dinner three hours or more before bedtime and avoid big snacks before bedtime. * Stop drinking sodas and drinks with caffeine. Provide water, juices or milk. 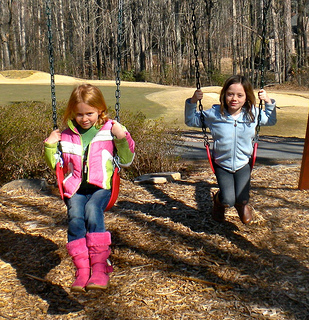 Children need natural exercise and fresh air to help them spend some of their youthful energy. When they get home from school before they start any homework, children need to run, walk, play football, or ride bikes. 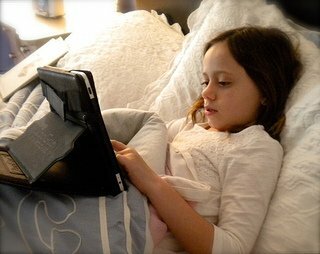 After sitting all day at school, the worst thing for a child is to sit some more watching TV, playing a video game or surfing on the computer. Encourage your child to play outside so that that built up energy can be expended. There are many studies that show the adverse affect of long hours of video or computer games. Agitation and restlessness are common among children who spend their free time in front of an electronic screen. Sleep aids for children include not only what to do, but what NOT to do, to promote sleep. Especially avoid TV, computer use and video games close to bedtime to prevent over stimulation. Keep the television/video games/computer/cell phones out of the children's bedrooms. Blue light and electromagnetic fields are emitted from electronic devices, both of which interfere with melatonin production. Melatonin is essential to give kids that sleep feeling. Children do not have the discipline it takes to NOT turn on some kind of electronic device that's sitting right there in their bedroom. It is just too tempting and it is unfair to expect this from a child. Children often experience sleep deprivation because of evening and nighttime activities that don't promote good sleep habits. Start promoting a good night's sleep for your child or children by establishing a regular nighttime routine, which is good advice for all ages. One of my favorite chapters is called How Parents Can Help Their Child Establish Healthy Sleep Habits; You Can Prevent Sleep Disturbances from Infancy to Adult. Just like children need to be taught healthy eating habits, children need to be taught good sleep habits. Naturally a child will choose a chocolate chip cookie over a fresh plate of vegetables - likewise they'll choose to stay up rather than take a nap or go to bed at an earlier time. * Before bedtime begin to settle down with relaxing activities rather than stimulating activities. 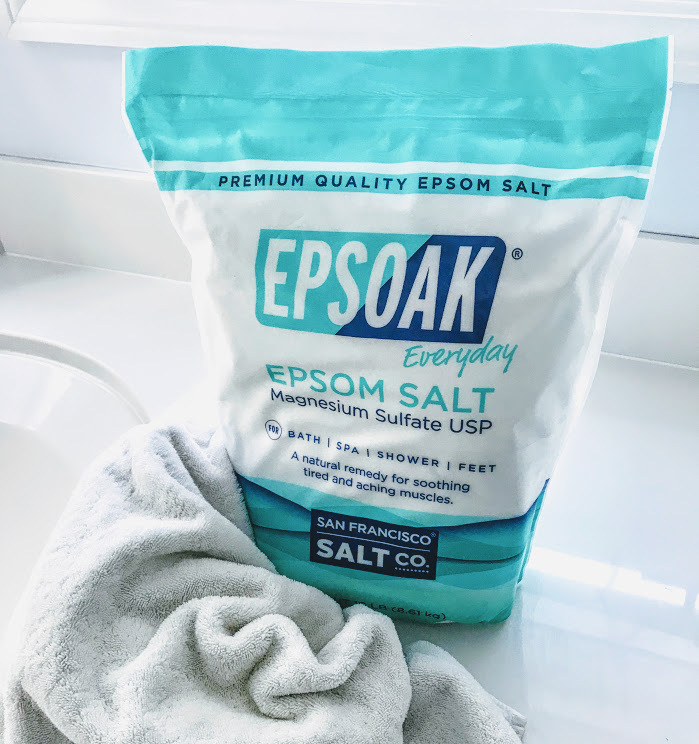 Try to include a relaxing bath using epsom salts or magnesium flakes. Magnesium is called the "great relaxer" and absorbing it through the skin via a bath or with lotion is a great way to calm and relax your child before bedtime. I've been using this magnesium flakes for my baths and I like how it quickly dissolves and even more importantly how it helps me unwind and relax. Did you know that most personal care products for kids contain toxic ingredients that disrupt hormones, cause cancer and contribute to allergies? The organization Healthy Child Healthy World lists the top 14 most harmful chemicals to kids, such as parabens and sodium lauryl sulfate - both of which are commonly found in kids shampoos and body washes. That's why I've made the switch to safe products that work, but are free of toxic ingredients. My top choice is the natural kids shampoo, body wash and lotion by Beauty Counter, a company that is committed to truth and transparency in their ingredient list and to only use products that are safe. * Establish a firm bedtime and work backwards to ensure you have time to complete everything before bed. Reflect on the time the children need to wake up in the morning and ensure they will get a full night's sleep according to the Sleep Chart Below. This prepares the children and signals the brain for bed with dinner, bath, reading a story, prayers, and lights-out. This bedtime routine chart provides a structured way to teach a child good sleep habits and patterns. The child is recognized for actions like for staying in bed and not calling for water, toys, etc. The chart allows the child to be rewarded for good sleep behaviors with daily stickers and then a special reward at the end of the week - whether it is a toy, a picnic lunch or a new book. This is a helpful tool especially for toddlers who are transitioning from cribs to beds or for parents who have found themselves exhausted from multiple night time interruptions. While it is true that some children have a harder time or take longer to unwind and to eventually fall asleep, it is not true that children have a melatonin deficiency. Melatonin is a hormone that is produced by the pineal gland to help induce sleep. Just as adults are tempted to look for sleep aids in a bottle, parents often are tempted to look to some type of sleep medication or supplement for a child that has difficulty sleeping. Melatonin is a hormone and in fact cannot be purchased over the counter in Europe. Resorting to melatonin medication will not help you explore why your child is struggling with sleep. Giving your child a pill every night will reinforce the idea that he/she is not capable of falling asleep without some type of medication or supplement and reinforce the beginnings of unhealthy sleep habits. 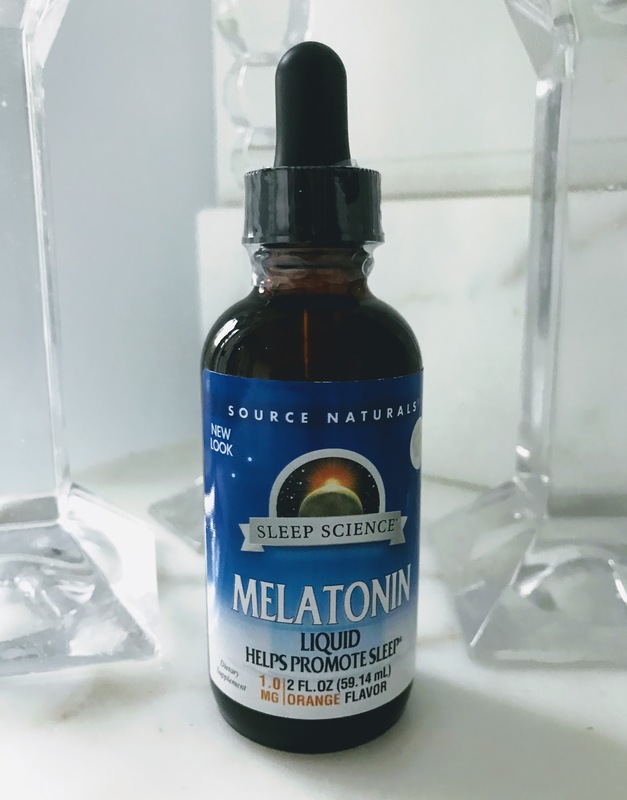 Dr. Marc Weissbuth the author of Healthy Sleep Habits, Healthy Child writes, "Melatonin supplements should not be given to babies or young children to make them sleep better: there is no evidence that it is safe." However, there are things you can do to help stimulate your child's brain to secrete this helpful sleep hormone. Melatonin secretion increases in response to darkness. As your child is getting ready for bed start dimming the lights. Get some tips in the next section on Sleep Environment. Blue light blocking bulbs can be used to help promote melatonin secretion. For children who have trouble falling asleep use these bulbs in their bedroom and bathroom. Most other bulbs emit blue light which blocks the production of melatonin which is needed to help give us that sleepy feeling. While getting on their pajamas use a small bedside light with a low wattage bulb - like 40 watts rather than a bright ceiling light. The same is true for the bathroom. Use even a small night light while brushing teeth or washing up. Don't turn on the bright overhead bathroom lights. While reading books before bedtime use the same low light bed lamp to read. 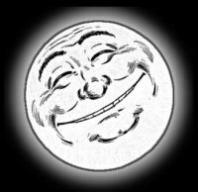 When it is time for bed, it's best to have no lights on in the bedroom, not even a night light. 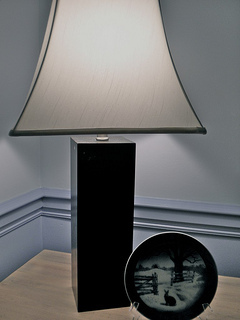 Use room darkening shades to keep out outside lights as well. Remember absolutely no electronics in the bedroom - no handheld video games, no TV, no iPods or iPads, etc. All of these stimulate and excite the brain and are good for daytime use but prevent the child from relaxing at bedtime. When kids sleep better and longer, guess what .... parents do to. One handy gadget that works well for small children is a clock that tells them, "its to darn early, don't wake up your parents!" A consistent bedtime routine is time consuming, but the payoff is helping kids develop healthy sleep habits and providing adequate restful sleep. Bedtime books and soothing music are my favorite sleep aids for children. 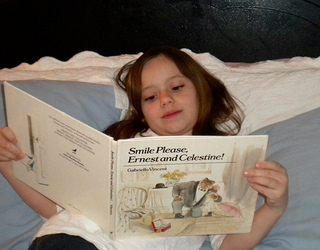 Reading to kids or grandchildren before bed has always been a favorite time of day for me. It's a very comforting and reassuring time for the child when he/she has your full attention and re-establishes a loving bond after a full day of school and activities. There are children's books that are about sleep and sleepy animals. I can't say that they help more than another well written children's book but they do help promote the concept that it is bedtime. The animals need their sleep and so do you. The sweet sing song rhymes and colorful illustrations mean I usually read it more than once before lights go out. Music CD's or calm books on tape make good sleep aids for children. Our granddaughters love listening to soothing music to fall asleep. One evening when they were spending the night I put on The Little Mermaid, but when Poor Unfortunate Souls started playing, all of my good intentions backfired. So now I play Baby Beluga Raffi has a very soothing voice and sound. You can create your own playlist or download a whole album. Play the same album routinely so that your child will associate the music with sleep. Eventually the music or song will actually help signal the brain that it's time to unwind and fall asleep. Use a white noise machine every night and soon your child's brain will associate the sound with sleep. You can buy a machine like this one pictured or download an app onto your iPod and play it on a speaker. White noise can filter out other sounds going on in the house or outside and the soothing sound can also help trigger the sleepy response. Sometimes a bedroom can be too quiet and a constant background noise can calm the mind. 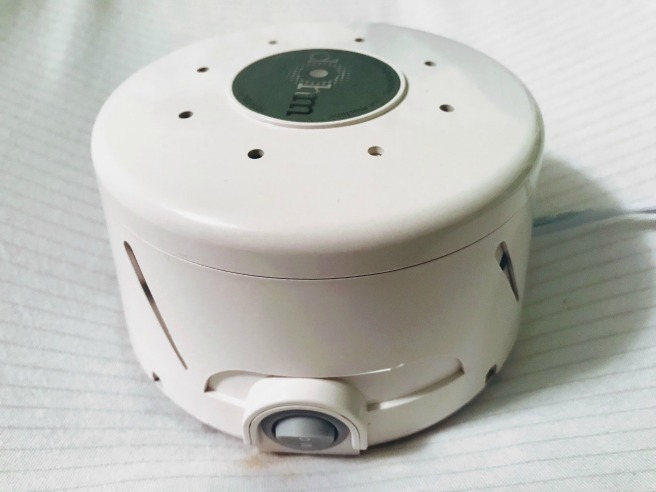 Whenever our grandchildren are sleeping at our house - for naps or overnight, I always have the white noise device on. This one runs continuously through the night. You can change the sound and the speed of "the whoosh" to adapt to your situation. The Marpac Dohm-DS is the official sound conditioner of the National Sleep Foundation. It's small and portable so you can take it with you when traveling. My daughter was asking me about a magnesium oil to help her 4 year old with her sleep. The Kid Safe Calming Magnesium Oil is the best for children because it doesn't cause any itching or stinging like other magnesium sprays. Other sprays also leave a white flaky residue that later starts to itch and then needs to be wiped off. Lavender and chamomile oil have been added for a pleasant fragrance and for its sleep promoting qualities. This important calming mineral is readily absorbed through the skin. Roll it on the bottom of each foot with a little foot massage just before bed or it can be used on an area where there is any soreness. Kid Safe Magnesium Oil. Gentle blend of Magnesium Oil and Aloe Vera will not burn or itch. Easy to Use Roll-on Applicator. Great for Calming, Headaches, and Sleep. Play an audio book as your child falls asleep. Listening to a book can be a great distraction from busy thoughts about past events or the day ahead. Do not give the child the iPod as that can be a distraction. Place it in a speaker/charger. We'd rather not use a blue tooth speaker because of the EMF's in the bedroom. 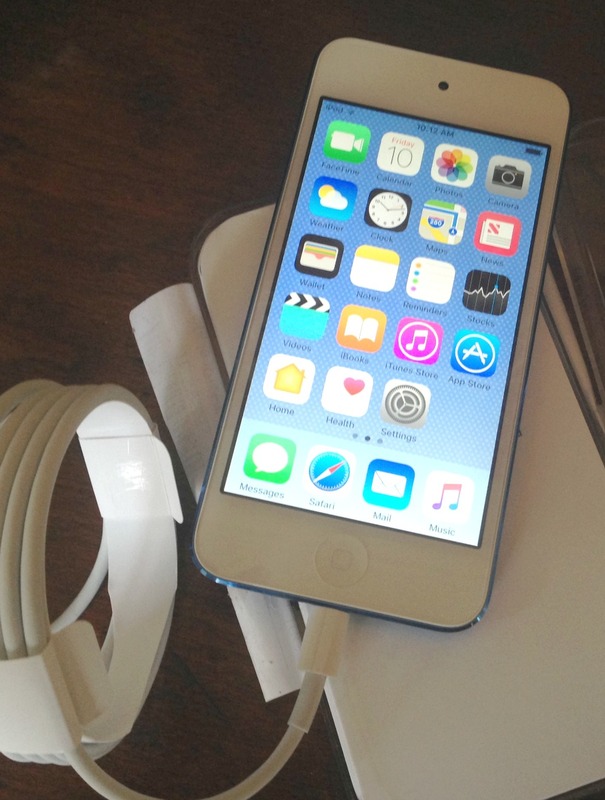 Audio books can be downloaded to your iPod (then turn to airplane mode so the device is not emitting EMF's.) or you can play CD's. A favorite set of audio books for kids is the Magic Tree House Collection. You can listen to a sample first to see if you think your child would like the sound of the reader. This chart comes from The American Academy of Pediatrics Guide to Your Child's Sleep. The sleep time is for 24-hours, which includes nighttime and naps. Children's sleep needs will vary with age. Observe your children's behavior. Are they sleepy during the day? Are they wired at bedtime? Could they be sleeping too much or not enough at night? Sleep aids for children include outdoor playing during the day, calming activities at night, eating healthy foods, and removing caffeine. Be the parent and set your child up for a quality night sleep with a winding down routine. If you find that these natural sleep aids are not helping your child or if they are still tired after the required hours of sleep seek the medical advice of your child's primary care doctor. Go from Sleep Aids for Children to Childhood Insomnia. Go from Sleep Aids for Children to Sleep Aid Resource Homepage. 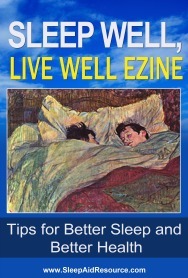 Sign up for our free Sleep Well, Live Well Ezine. Learn practical tips that will help you, your family or friend once again find that you can Sleep Well to Live well. Copyright 2010-2019. www.SleepAidResource.com. All Rights Reserved. It is a crime to copy or reproduce any content on this website without prior written permission. Violators will be prosecuted to the fullest extent of the law. All Information is Free for Personal use, NON commercial use. I promise to use it only to send you Sleep Well, Live Well. Please note that while I do receive commissions from some of the things promoted on this site, I recommend them because I feel they would be of benefit to you. Advertisers/Affiliates have been hand-picked so that only quality products are recommended. I have used them in my own life and share them with you because that's what friends do.